Infrastructure is an asset class made up of physical assets that provide essential services to society. Put simply, these are the services we use and interact with every day. We use gas, water and electricity to carry out daily activities and use rail and roads to get from location to location. Broadly, infrastructure can be categorised into two key buckets: regulated assets and user-pays assets. With regulated assets, the regulator determines the revenue a company should earn on its assets. If an asset earns too much the company is required to return some of its revenue to customers by lowering prices. Conversely, if the asset earns too little, the company is able to increase its prices. This mechanism leads to a relatively stable cashflow profile over time. Additionally, the regulator periodically takes into account inflation, to which price increases are often linked. As such, these assets also act as a good hedge for inflation. With user-pays assets, a company’s revenue is dependent on how many people use its assets. These physical assets – rail, airports, roads and telecommunications towers – move people, goods and services throughout an economy. Therefore, as an economy grows, develops and prospers, these assets also typically grow. For instance, as more people use, and to some degree depend on, mobile phone data, we see mobile communications towers adding capacity to meet demand. RARE focuses exclusively on global listed infrastructure. These are publicly traded infrastructure securities such as the shares of electricity, water and airport companies. Listed infrastructure investors can enjoy the attractive characteristics of the infrastructure asset class, including long-term stable cashflows, lower correlation with other asset classes and inflation protection, while enjoying the added benefits of listed markets such as liquidity and lower fees. Importantly, investing in listed markets provides the flexibility to take advantage of market movements and to invest where we, as active managers, see value. We have strong thoughts on what defines infrastructure. On our inception in 2006 we felt the existing infrastructure indices were flawed in several ways. Based on what we see as the key characteristics of infrastructure, we have created proprietary investment universes, bespoke to the requirements of each of our three active strategies. This framework has remained unchanged for more than 10 years. The company must own a hard, physical asset. This hard asset must provide an essential service to society or an economy. There must be robust frameworks in place to ensure that we, the equity holders of the companies we invest in, get paid. This framework can be regulatory in nature or based on long-term concessional contracts. Both structures provide visibility over the company’s ability to generate cashflow. So when constructing our investable universe, the key characteristics we look for in a company come down to the stability of cashflows, as well as the level of their predictability. In assessing this we also look at the political and legal framework in which the company operates and its pricing power. Across our three investment universes, the companies held are either regulated utilities or owners of long-term concessional assets. By their very nature, these types of companies provide a high level of confidence that they will have cashflow generation well into the future. 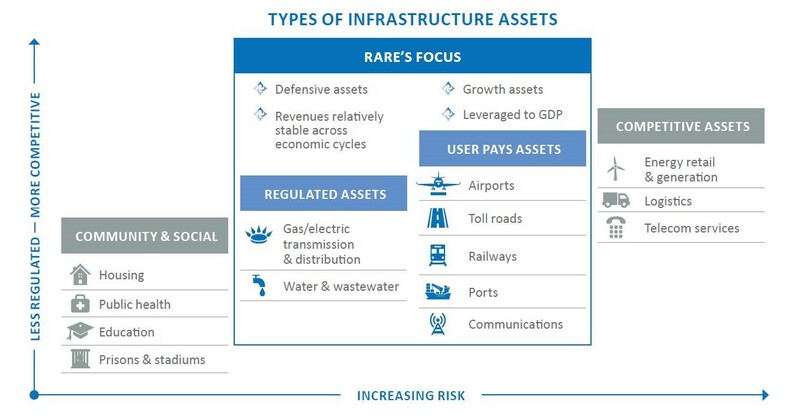 Figure 1 below summarises what types of infrastructure assets we focus on and the ones we exclude. In constructing our investment universe, there are two main types of infrastructure assets we avoid. The first is competitive assets that attract a higher risk relative to regulated and user-pays assets. Within the electricity sector, for instance, we are able to invest in the companies that own the electricity, transmission and distribution. However, we exclude companies exposed to wholesale energy prices. These generate electricity and sell it back to the electrical grid. They are subject to the forces of supply and demand, which in turn reduces the predictability and reliability of their cashflows, which increases their relative riskiness. Airport services such as refuelling and baggage handling, for instance, are also excluded from our investable universe, because companies providing the services do not own the hard assets and merely have a contract. As there are no barriers to entry, such as regulation or long-term concessional agreements, there are limited safeguards to prevent another service provider undercutting them. This lack of framework increases the relative riskiness of these types of securities. The second type is community and social assets, which include housing, public health, education and prisons. These assets tend to be unlisted and as such there are limited opportunities in the listed market. Although these assets are not competitive in nature, we exclude them as they often include property exposure and/or servicing and operating businesses. Generally, their business models include availability-based payments, often inflation-linked, for a defined contract term. During this period, contracts are unable to be repriced. As a result, they have neither the protection of regulated assets in terms of the ability to reprice the contracts, say for changes in bond yields, or pass through of operating costs; nor the upside of infrastructure assets in terms of the benefit of volume improvements, namely exposure to economic growth. As a result, community and social assets tend to act as long-duration assets with significant real bond yield exposure. Steve Williams is Head of Australian Retail at RARE Infrastructure. Focused exclusively on global listed infrastructure, RARE is a specialist investment manager founded in 2006. RARE’s investment approach is reflected in the name Risk-Adjusted Returns to Equity (RARE) with the understanding and management of the relationship between risk and return at the heart of its bottom-up investment process. RARE’s mission is to provide investors with portfolios of high-quality global infrastructure assets with the goal of delivering strong absolute returns over an investment cycle. This article appeared in the August 2018 ASX Investor Update email newsletter. To subscribe to this newsletter please register with the MyASX section or visit the About MyASX page for past editions and more details. This article appeared in the August 2018 ASX Investor Update email newsletter. To subscribe to this newsletter please register with MyASX. This article appeared in the August 2018 ASX Investor Update email newsletter.